Yesterday morning we planned to escape our house at 4:30 a.m. to make it to the starting point for our MS150 ride. Our children decided to wake up early with us to say goodbye, which we thought was sort of sweet. We know they won’t always care whether we’re around or not, so we try to appreciate the moments when they appear to like us. At 4:35, we were pretty much ready to go, their aunt was here to take over for us, and so we began to say our goodbyes. Luke, our affectionate but more independent child, hugged us and was ready to go back to bed. Joe, however, got very sad. He was near tears, requested repeated hugs, and was delaying our departure quite effectively. “Joe…what is the matter?” I asked. “I just don’t want you to go,” he replied. For as much as he was carrying on, though, I began to wonder if he sensed something dire for us on our ride. Did he know something we didn’t know? I shook that nasty little thought out of my head. “We will see you tomorrow afternoon by 4,” I assured him and then we escaped. Knowing his state of mind when we left, I recorded a video message for him and sent it to his iPad last night when he was not yet home from a day of fun with his aunt. We desperately needed some rest, so we turned out the lights at 8:15 after the message was sent. This morning we awoke to determine he had texted me for a conversation at 10:43 last night and tried to FaceTime his father at 10:45. Crazy kid. Later today, we were waiting in a shady spot for our team to gather so we could ride through the finish line together when a text came in from Joe. He was asking us to come home. I texted back and told him we’d be home in “about” an hour. Exactly 57 minutes later he texted again. (Clearly I have spoiled him by being true to my word.) I told him we were about fifteen minutes away. When I walked in the door, Joe yelled “Mom” and ran to give me a hug. Luke joined him. It was such a nice welcome home after our long weekend of riding. I told them that we would unload the car and then we could catch up. In the few minutes it took us to get our stuff back in the house, the boys had disappeared into a neighbor’s house to play with their kids. Guess that shows how much they missed us. I’ll consider myself fortunate that they remembered my name at all. It sounds like he he just wanted to know you were okay. Now, he can take you for granted again. 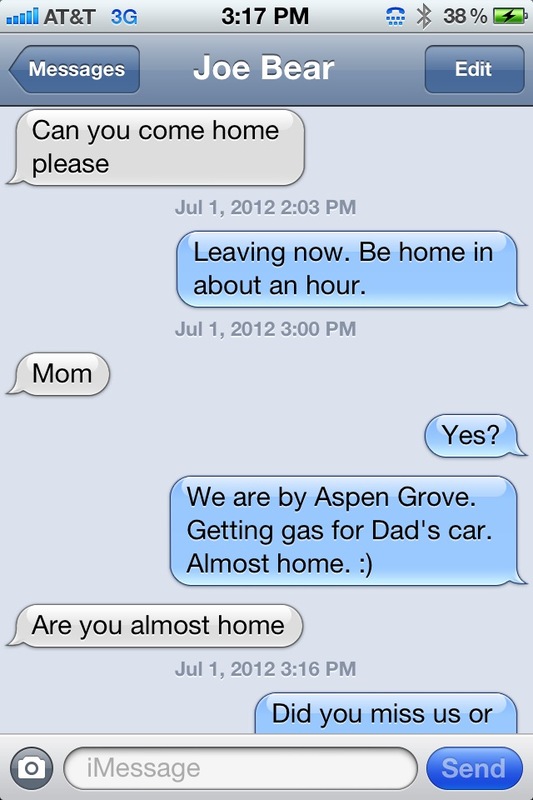 Ahh to be a parent. Yes. That is how it works. Just part of what we signed up for, I guess. I think he truly missed you! How did your ride go? What a great accomplishment!